On a frigid January 6 morning, Frank Mitchell and I met with Itasca State Park Naturalists Connie Cox and Sandra Lichter at the Brower Visitor Center in Itasca State Park. (The temperature warmed to minus 20º F for our 10 a.m. meeting.) Our purpose was to study old maps that might help in tracing the route of the old Jefferson Highway that once wound its way around the hills and lakes of Itasca Park. The highway, designated in 1916, was the first north-south transcontinental highway in the United States. It connected New Orleans, Louisiana with Winnipeg, Manitoba. Frank and I grew up together along visible remnants of the original Jefferson Highway. What makes the highway interesting to study is that it was not built as one highway, but was made up of selected local existing roads and trails. Over the years the route was straightened, leveled, and shortened as newer city, state, and federal highways were designed along and over the original route. As a result, many segments of the Jefferson Highway were renamed. Some routes were abandoned to become local trails while others disappeared, overgrown with brush and trees. With the information gained from our meeting, the four of us will be better prepared when the Lake Country Scenic Byway hosts the Third Annual Jefferson Highway Association’s International Conference. The Association has selected Park Rapids, Minnesota as its 2014 Conference site. Frank was instrumental in steering the Jefferson Highway Association to Park Rapids. The conference will be held on May 30 and 31. Members and citizens in and near Itasca State Park, Park Rapids, and Menahga, as well as surrounding communities will be preparing for the event. Connie and Sandra will be organizing the Conference bus tour of Itasca Park, along with other activities, and I will be one of several presenters at the C’mon Inn in Park Rapids. For more information about the Jefferson Highway, you can click here to find an earlier blog post, or click here to visit the Jefferson Highway Association’s website. Membership in the Association is open to anyone interested in the Jefferson Highway. Membership forms are available on the website. This entry was posted in All blog entries, EDGE OF ITASCA stories, Jefferson Highway, Minnesota Tourism. Bookmark the permalink. I live in St Joseph, Missouri on the JH. Another Auto Trail was the Itasca Park Highway. I entered “Itasca Park Highway” into Google and a few entries down was one titled “cemetery stroll…..” which was a column by Carolyn Bless Larsen of the Weston, Missouri History Museum She had a piece about having a hand drawn map showing the Itasca Park Highway passing through Weston, a small town north of Kansas City and South of St Joseph. I found a reference to it running by Keene’s Corner at Bean Lake a few miles north of Weston. I then found a piece in the Weekly Kansas City Star from July 11. 1926 saying that the Itasca Park Highway ran from St Joseph to Itasca State Park. I found a source that had the IPH running to Maryville Missouri on the Iowa line. I looked at a map on your site and find it running down to Spirit Lake Iowa. When I look on historic maps put out by the Iowa DOT I do not see the Itasca Park Highway listed. My thinking is that if the IPH ran to Spirit Lake on the north side of Iowa and from Maryville, Mo just south of the southern border of Iowa, then it must have traversed Iowa from north to south. Or was the Itasca Park Highway another iteration of the JH.? If so, it seems a bit strange that I didn’t find it in Iowa but that it shows up in the small community of Weston just north of Kansas City. Here is something else. We can read about life in the Middle Ages in some intricate detail, but the story of the National Auto Trails which is significant in so many ways economically, politically and socially including shifting the movement of large numbers of people from the social transportation of trains to the individual transportation of cars. It was a massive alteration to the country both on the landscape but also with psychic landscape. The highways along with motion pictures opened up the country to everyone. The westward movement saw vast numbers of people on the move. However they were going to someplace else. The automobile and the auto trails allowed folks to go and come back. Then there was the business and social aspect of the Good Roads Movement and later the various associations connected with the National Trails. All of this is of historical significance that seems to have been lost to our collective national memory. 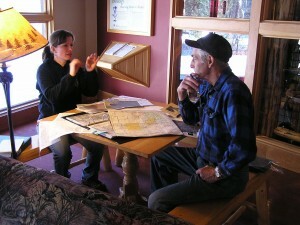 Meetings were held, routes were planned, routes were marked, millions of people traveled those routes staying in hotels and resorts and etc along those routes and yet when it comes to merely establishing where a particular Trail ran, we find that very difficult to do, despite all the evidence. Thanks for your questions regarding the Itasca Park Highway and your comments. I have been studying the subject of early highways similar to the Jefferson Highway for a forthcoming blog, so your letter is timely. I will reply to you individually by email and hope my next blog will help address some of the issues you mentioned.